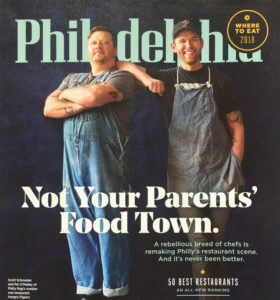 It’s no secret that Philadelphia is experiencing a restaurant renaissance. These days, the City of Brotherly Love has much more to offer than meaty, cheesy stereotypes. The city’s collective palate expansion is undoubtably linked to another trend: the migration back into the city. People want to live downtown and they want culinary choices. Given these trends, we came up with a fitting challenge. The Challenge: pair three of our listings with a superb restaurant within one block of each respectively. Spoiler alert: it was hardly a challenge at all. We begin our journey on the 46th story of The Residences at Two Liberty Place. 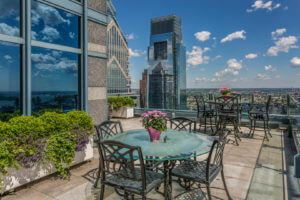 50 S 16th St #4604 Philadelphia, PA 19102, listed by Melanie Stecura, has some of the most incredible views in the city. It’s unrivaled 2400 square foot terrace overlooks iconic sights such as City Hall, the Ben Franklin Bridge, and both Delaware and Schuylkill Rivers. The sophisticated and dynamic layout (half of the 46th floor of Two Liberty) is an ideal place to host even the best attended soiree. A world-class residence would not be complete without world-class dining options. It was difficult to hone in on one eatery, but after careful deliberation we chose to pair this listing with Gran Caffe LaQuila. Famous for it’s Gelato, roasted coffees, and inspired pairings (ravioli topped with gelato, for example), this true-to-form Italian Cafe is just one block over and 46 floors down from 50 S 16th St #4604. 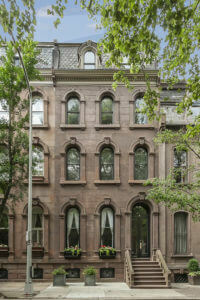 Spruce Street hosts some of the City’s finest historic-homes. Elegant porticos, marble-laden stoops and mature trees line Spruce Street’s Center City blocks. Amongst these blocks, Kurfiss Sotheby’s International Realty currently lists for sale a meticulously restored city-mansion: 2012 Spruce Street, Philadelphia, PA 19103, listed by Drew Callaghan. This residential masterpiece boasts a handsome brownstone facade, 14′ ceilings, and tasteful millwork throughout. Its proportions make it an excellent residence for entertaining. However, if its future owner did not feel like hosting, he or she would not have to walk far to find some excellent dining options. Just a half block from 2012 Spruce Street is Audrey Claire— a transportive Mediterranean BYOB. 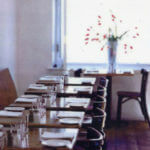 According to their site, “[b]etween the South-of-France simplicity, Israeli couscous, mezze, grilled fish served head to tail, and the olive oils of those rustic lands, you’ll feel like you’ve taken the grand tour.” I will admit I am biased as Audrey Claire is one of my personal favorites. 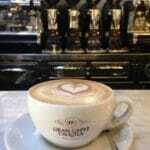 The food is adventurous and the open-window, cafe-style vibe is really enjoyable. In Queen Village, an increasingly desirable neighborhood south of Old City, the School House Condo building features some of the coolest lofts in the city. 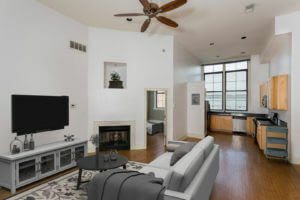 The bilevel 246 Fitzwater St #1 Philadelphia, PA 19147 , listed by Karen Regan, features parking, 3 spacious bedrooms, a gas fireplace, soaring windows and hardwood floors. With a handsome historic exterior and a modern interior, the School House Condo Building is a pleasing juxtaposition of styles. Queen Village offers a wide variety of culinary indulgences to its residences. 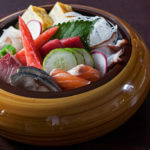 Just one block from The School House Condo is Royal Sushi and Izakaya. Cherished by locals, this Japanese informed Sushi and Steak House is a go-to spot in Queen Village. Bring 10 people or go solo. There is anime projected onto the walls for eye candy. Not to mention the top notch nigiri, skewers and generous chirashi bowls.